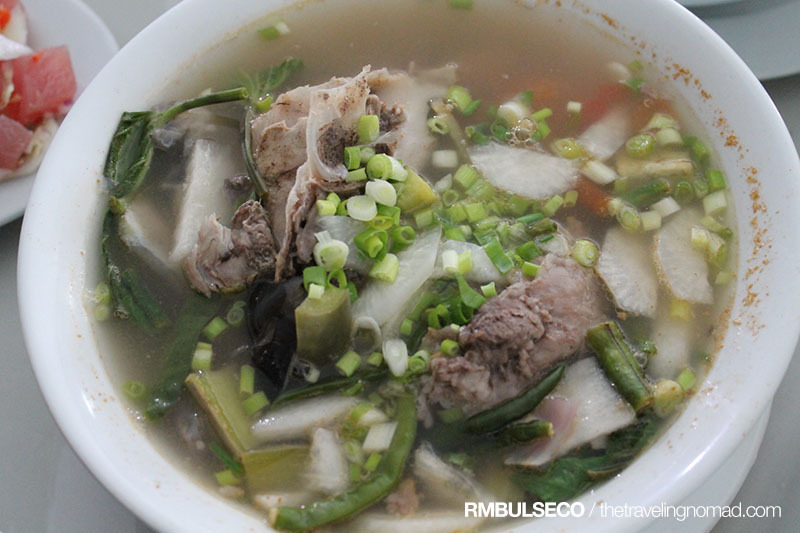 "I have been with this kind of business since the 70s," Domingo Ang, the owner of Marina Tuna, quipped. "I have witnessed on how the tuna industry boomed. 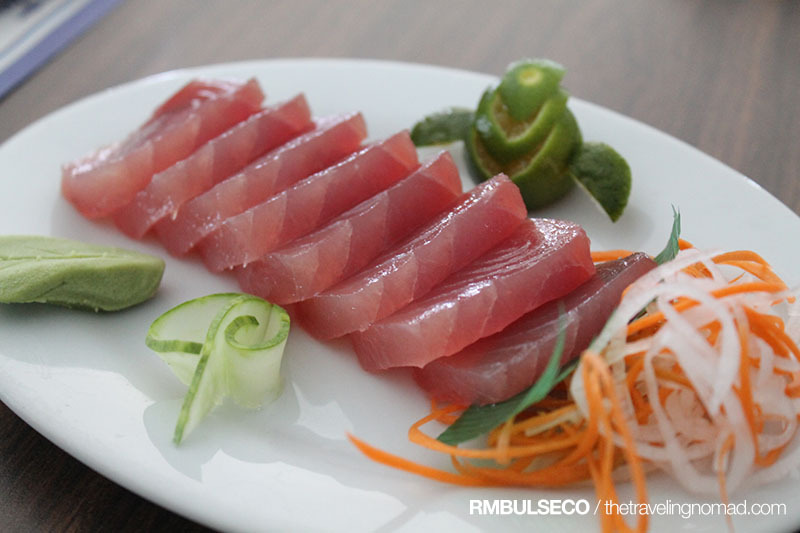 Did you know that Japan imports our tuna for their sashimi? It just shows that the best tunas can only be found here in the Philippines, specifically in the southernmost part of the country,=." "Years ago, when I first opened this restaurant, I thought of ways on how to sustain the satisfaction of the customers. So I tried this crazy idea - preparing tuna in ten ways. At first it was daunting and risky. 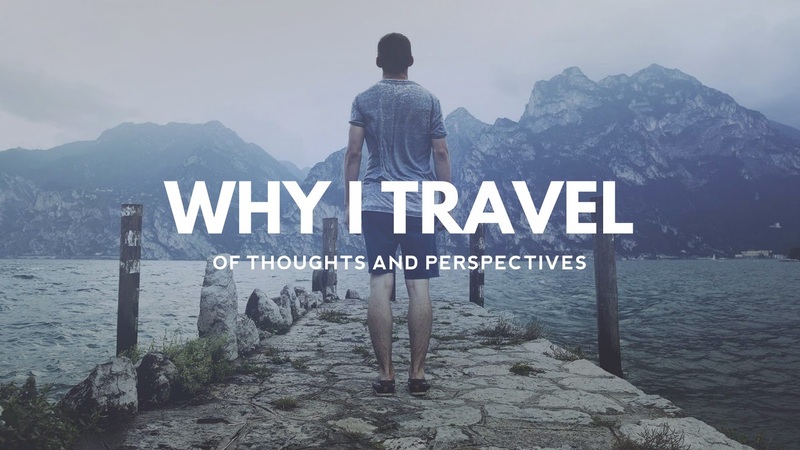 'What if' thoughts have floated in my mind while planning this. Thank God, it was not really that bad," he further added. I honestly didn't believe when a good friend of mine told me that this particular restaurant prepares tuna in ten ways. 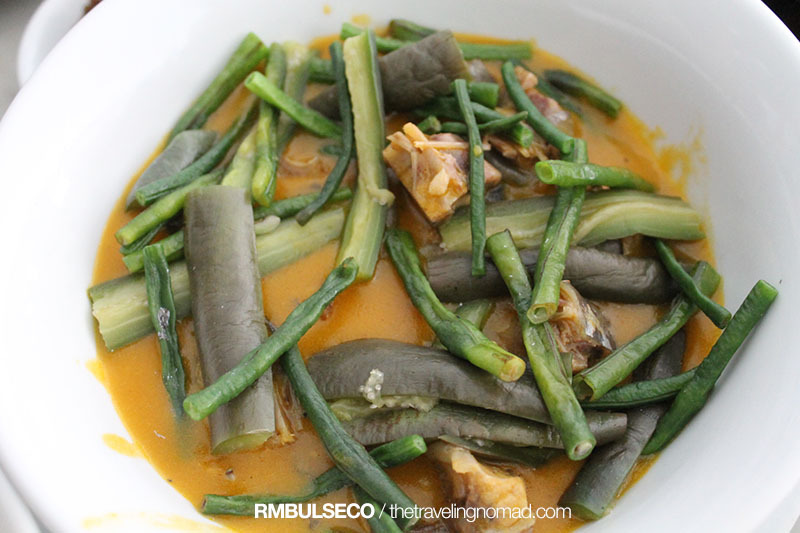 I thought that the Tuna Kare-Kare, Tuna Eye Soup and other tunabananawhatnots won't be that good. It actually turned out to be good. Well, good is an understatement... IT WAS REALLY GOOD! 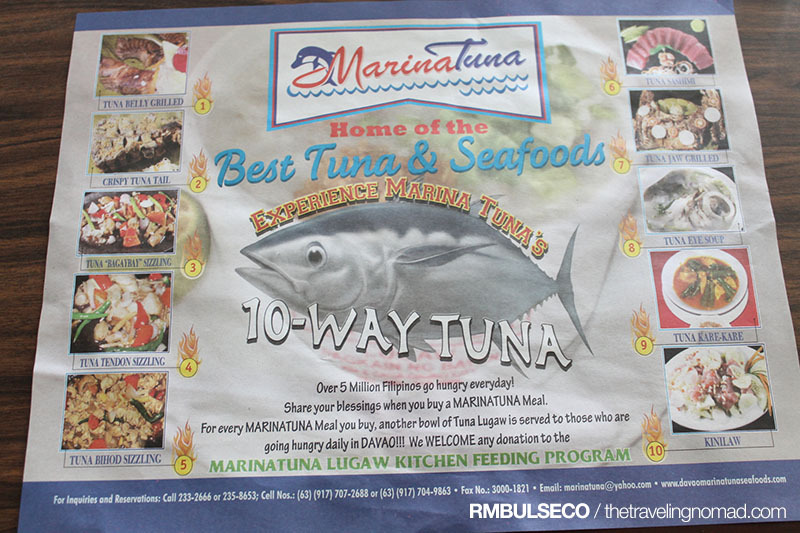 Their paper mat shows 10-Way Tuna or 10 ways to enjoy tuna, namely tuna belly grilled, crispy tuna tail, tuna bagaybay sizzling, tuna tendon sizzling, tuna bihod sizzling, tuna sashimi, tuna jaw (panga) grilled, tuna eye soup, tuna karekare, and kinilaw. Their tunas are all fresh and juicy. Their grilled panga, sashimi, crispy buntot and belly are to die for!!! I SWEAR!!! 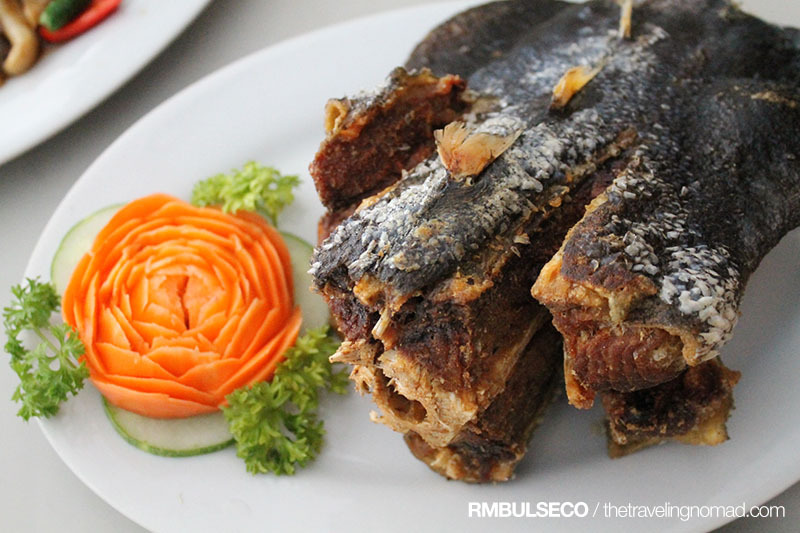 Marina Tuna is located at Km. 8, Bo. Pampanga, Sasa, Davao City. For inquiries, please call (082) 233-2666. 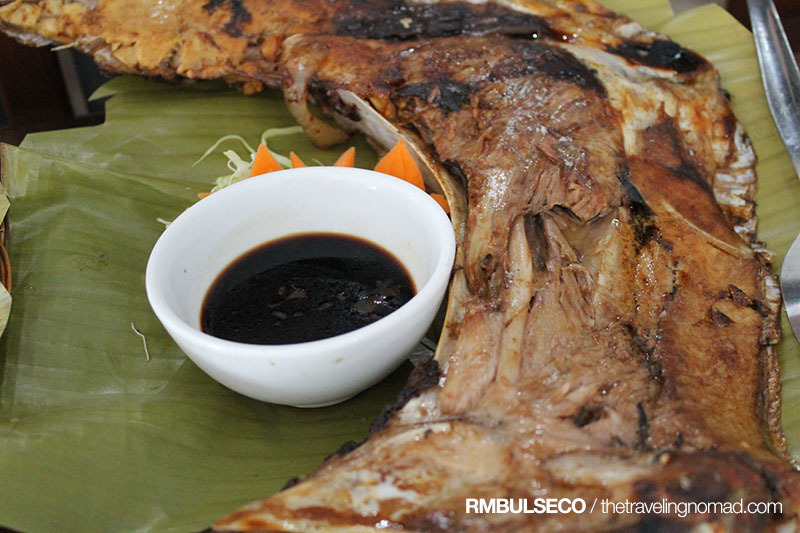 Tuna 10 Ways is a great way to experience Davao's cuisine. Glad you made this stop. Amazed! My Davao has grown big since I left almost 6 years ago. So proud!